Necronomicon - ZineWiki - the history and culture of zines, independent media and the small press. Necronomicon is a horror film fanzine by Necro Neil published in Yorkshire, in the UK. The first issue was released in May 2001. It is a black and white, A5, cut and paste, stapled publication. As of 2013, 26 issues have been published. It was named after the Book of the Dead from The Evil Dead movies and is refered to as 'Necro', where Necro Neil gets his nickname. It is unrelated to the 1990's fanzine of the same name. Necronomicon has been described by it's author as " A love letter to the horror genre" and is known for its personal diary style. The first issue explained the horror films Neil grew up with as a child in the 1980's and in the following issues went on to the challenge of commenting on every horror film he watched in the ten years it has been published. 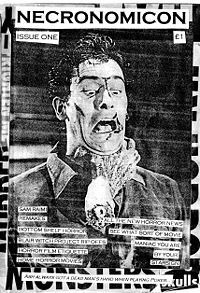 The fanzine started off in a tight format of features about his favourite films, directors and actors (such as Evil Dead, An American Werewolf In London, Sam Raimi, Peter Jackson, Bruce Campbell) with reviews of dusty VHS rentals from his local video store until its closure. It developed into a much looser and personal style over ten issues but kept the nostalgic and geeky sense of humour. It now focuses on newly discovered retro horror films, mainly inspired by his parents video rental review book from the early 1980's. The editor has been the sole writer and composer of the fanzine for over ten years with rare contributions from readers. Necronomicon is noted for debuting whilst VHS was still popular and has recorded the arrival of DVD, as well as online movie streaming. It publishes on average two to three times a year and is sold through Yorkshire comic retailers, fanzine fayres, film festivals and all issues are available through Etsy year round. This page was last modified on 21 May 2013, at 13:47.